The region of Cappadocia in central Turkey is home to one of the most spectacular landscapes in the world – deep valleys and soaring rock formations dotted with homes, chapels, tombs, temples and entire subterranean cities harmoniously carved into the natural landforms. Cities, empires and religions have risen and fallen around these unique underground havens, yet they remain occupied to this day. Through the ages, the Hittites, Persians, Alexander the Great, Rome, The Byzantine Empire, Ottoman Empire, and Turkey have all governed this spectacular region of Central Anatolia. Cappadocian Region displays a beautiful combination of nature and history. 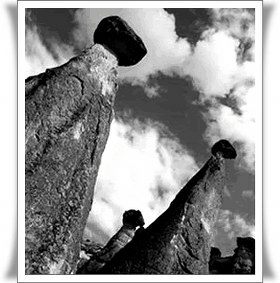 The geographic movements had formed the "peri bacaları"(Fair chimneys) and during the historical development process, mankind had settled and inhabited these natural wonders, fairy chimneys and carved houses and churches inside these formations and adorned these settlements with frescos, carrying the traces of the thousands of years of their civilizations. 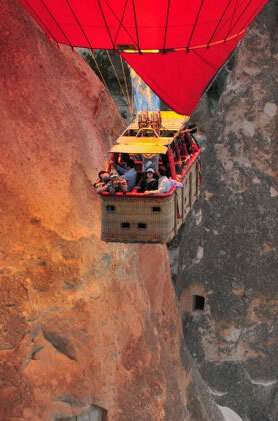 The current Cappadocian Region is an area covering Nevşehir, Aksaray, Niğde, Kayseri and as for the more narrow rocky Cappadocian Region, Üçhisar, Ürgüp, Avanos, Göreme, Derinkuyu, Kaymaklı, Ihlara and its environs will be included. Cappadocia is defined as the country between the Black Sea, the Upper Euphrates, the Taurus Mountains, and the river Halys. East of the Euphrates is Armenia; if a traveller crosses the Taurus through the Cilician Gate to the south, he reaches Cilicia; and to the west of the Halys is the country that was known as Phrygia and (later) Galatia. The rocky landscape that is called Cappadocia today, is only a part of the ancient country. The plain north of the Taurus might be called Cappadocia Proper; it is essentially the land around Mazaka (near modern Kayseri). This country, originally called Tabal, is extremely green and fertile. Greater Cappadocia includes territories to the north, which are sometimes called Paphlagonia or Pontus, along the Middle Euphrates, which is called Melitene, and to the west, Lycaonia. In the Bronze Age, Cappadocia was the heartland of the empire of the Hittites. The people spoke Luwian. After the collapse of the Hittite world, the inhabitants of Tabal were divided into several small states (e.g. Tyana), loosely held together by the prince of Bit Burutaš, a fort near modern Kululu. Pottery finds prove that these little states had trade contacts with Phrygia, and it appears that the Assyrians watched this economic influence with some suspicion, but during the reign of Sargon II, the two nations concluded an alliance (710/709). Perhaps, the Royal Road between the two capitals, Nineveh and Gordium, dates back to this period. At the beginning of the seventh century, the Cimmerians invaded Urartu, Cappadocia, and Phrygia. The Phrygian king Midas appears to have been defeated in 696/695 by the invaders and committed suicide. While the Cimmerians settled on the plains of Cappadocia, Midas' kingdom was taken over by a dynasty that was based in Sardes, Lydia. Its king Gygesdefeated the Cimmerians in c.665, but was killed in action in 644. However, later Lydian rulers (e.g., Alyattes) warded off the invasion, and started an offensive to the east, gradually approaching Cappadocia. A similar development started in the east, where the Median tribal federation became increasingly powerful. In 612, the Medes andBabylonians had sacked Nineveh and overthrown the Assyrian Empire; while the Babylonian king Nebukadnezzar was occupied in Syria, the Medes annexed Armenia and proceeded to Cappadocia. On 28 May 585, the armies of the Lydian king Alyattes and the Median leader Cyaxaresmet in battle, but after a solar eclipse, they decided to conclude a peace treaty. The Halys became the border between the two states; Cappadocia was to be subject to the Medians. Their rule was short-lived, though: in 550/549, they were conquered by the Persian king Cyrus the Great, who went on to invade Anatolia, and in c.547 he conquered Cappadocia and Lydia. Cappadocia is derived from Old-Persian Katpatuka, the name used by theAchaemenid administration to describe the satrapy beyond the Taurus and Euphrates. According to the Greek researcher Herodotus of Halicarnassus, the Cappadocians, together with the Hellespontines, Asian Thracians, Mariandynians, Paphlagonians, Phrygians, belonged to the third tax district and paid a yearly tribute that was worth about 360 talents. What they had to contribute exactly can perhaps be deduced from the relief on the Eastern Stairs of the Apadana at Persepolis, where the Cappadocian tribute bearer offers a bridled stallion, an overcoat, a coat, and trousers. The first satrap known by name is one Ariaramnes, who is mentioned byCtesias of Cnidus (Persica, 20) as conducting an expedition to Scythia at the beginning of the reign of Darius I the Great (522-486). Ariaramnes' successors are not known for certain, although a prince named Gobryas commanded the Cappadocians in 480 when Darius' son Xerxes invaded Greece. He was the king's half-brother, which suggests that the Cappadocian unit was of some importance. We happen to have a description of Cappadocia in Xenophon's Anabasis, which is the history of the civil war between the Persian king Artaxerxes II Mnemon and his brother Cyrus the Younger in 401. From this, we can deduce that the southwestern part of Cappadocia now belonged to a satrapy called Greater Phrygia. We also learn the names of the tribes that lived along the shores of the Black Sea: Mossynoeci, Macrones, Tibarenes, and Paphlagonians. The description gives the impression that control by the central government was not very strong, and this is more or less confirmed by other information: we know that the Cappadocian town of Castabala was an almost independent temple state. On the other hand, in Mazaca was an Iranian fire shrine with Magians, which shows a very strong Persian presence. During the reign of Artaxerxes II, Cappadocia was divided into two halfs (Paphlagonia and Cappadocia Proper). The satrap of southern Cappadocia, a man named Datames (abridged from Datamithra) played an important role in suppressing a revolt and in a war against the Cadusians. Because of his valor, he was charged with the reconquest of rebellious Egypt, but when he discovered he had insufficient support at the great king's court, Datames decided to return to his satrapy. After the invasion of Egypt, led by Pharnabazus, had failed (373), Datames revolted. His coins show motifs that suggest that he courted native support. He defeated several opponents, cooperated with other rebels (Ariobarzanes in Hellespontine Phrygia;Maussolus in Caria, Orontes in Armenia, Autophradates in Lydia), but was assassinated before 362. The next satrap known by name is Mithrobuzanes, who was killed in action during the battle at the Granicus (334), in which the Macedonian kingAlexander defeated the Persian troops of Asia Minor. Alexander appointed Sabictas as new satrap, but his grip appears to have been weak, because we find a Cappadocian unit (commanded by Ariarathes) fighting in the army of the Achaemenid king Darius III Codomannus during the battle ofGaugamela (331). During Alexander's reign, his officer Antigonus the One-Eyed fought several battles to keep the roads through Cappadocia open. After the death of Alexander, on 11 June 323 in Babylon (text), his commanders elected Perdiccas as regent of the great conqueror's brotherPhilip Arridaeus and his still unborn son Alexander IV. A Greek officer named Eumenes was made satrap of Cappadocia (text). He had to fight against the Ariarathes who had fought for the last Persian king, Darius III Codomannus, at Gaugamela, and had continued to war against the localMacedonian commander Antigonus the One-Eyed. However, when Perdiccas invaded Cappadocia, Antigonus did not appear, which was one of the reasons why the successors of Alexander (the Diadochi) started to quarrel: the First Diadoch War. However, for the time being, Perdiccas was successful and Ariarathes was captured and killed. The main consequence of the First Diadoch War was the end of Perdiccas, his attempt to keep the empire unified, and the end of Eumenes' main supporter. At a conference in Triparadisus, a general named Antipaterreorganized the the Macedonian Empire (text), and appointed Nicanor as satrap of Cappadocia. With Antigonus, he had to expel Eumenes. This was the beginning of the Second Diadoch War (318-315), which was won by Antigonus, and when Nicanor died during the Babylonian War, the old one-eyed general added Cappadocia to his territories. However, he was defeated decisively in the battle of Ipsus (301), and the southern fringe of Cappadocia was added to the realms of Seleucus I Nicator (the Seleucid Empire). A nephew of Ariarathes, Ariarathes II, seized the central and northern part of Cappadocia, and was accepted by Seleucus as a semi-dependent ruler. (Northern Cappadocia became the new kingdom Pontus.) When Seleucus had died and his succession was contested by Ptolemy II Philadelphus, Ariarathes II and Orontes III of Armenia defeated the Seleucid army (c.280 BCE), which meant the beginning of independence. The lawful kingAntiochus I Soter acquiesced in this situation because he was involved in the First Syrian War against the Ptolemaic Empire. Ariarathes was succeeded by his son Ariaramnes, whose son Ariarathes IIIwas the first to accept the royal title. Nearly all Cappadocian kings called themselves Ariarathes, just like Egyptian kings of that age all called themselves Ptolemy and all Parthian rulers were known as Arsaces. The third Ariarathes was able to normalize relations with the powerful Seleucid neighbors and married Stratonice III, the daughter of Antiochus II Theos. This diplomatic alliance was further strengthened when their son,Ariarathes IV Eusebes, married Antiochis, daughter of his Seleucid cousinAntiochus III the Great. However, the decline of Seleucid power forced the Cappadocian kings, who by now had come to claim descent from the Achaemenid princePharnaces, to look for other allies. During the Second Macedonian War (200-196), the Roman commander Titus Quinctius Flamininus had defeated the Macedonian king Philip V, and because the legions had been recalled, a power vacuum had been created. Antiochus III was more or less forced to intervene in the chaos Rome had created, which offered the Romans the opportunity to intervene again. In the Syrian War (192-188), the legions swept away the Seleucid armies (battle of Magnesia, 190). Immediately, Ariathes IV switched sides. His daughter Stratonice IVmarried king Eumenes II of Pergamon, a Roman ally. Rome accepted this diplomatic gambit and supported Cappadocia when war broke out with king Pharnaces I of Pontus (182-179). Some ten years later, Rome requested Cappadocian support in the Third Macedonian War. In 163, Ariarathes V Philopator succeeded his father. He intervened in a crisis in Sophene (along the Upper Tigris), where he put Mithrobuzanes on the throne, a puppet king. The Seleucid ruler Demetrius I Soter now proposed to renew marriage ties, which Ariarathes refused. Demetrius now supported an insurrection by Ariarathes' brother Orophernes. The RomanSenate ordered the two dynasts to split the kingdom, but in 158, Ariarathes V was restored by king Attalus II Philadelphus of Pergamon, second husband of Ariathes' sister Stratonice. In 152, Ariarathes saw an opportunity to avenge himself on Demetrius. He joined a Rome-supported anti-Seleucid coalition; the other members were Attalus II Philadelphus of Pergamon and Ptolemy VI Philometor of Egypt. Together, they put the Seleucid pretender Alexander I Balas on the throne. Some twenty years later, king Attalus III Philometor, the son of Stratonice, died, leaving the Pergamene kingdom to Rome. Because a native leader,Aristonicus, tried to regain independence, war broke out, and Ariarathes V supported Rome again. In return, it received Lycaonia. When he was killed in action in 131/130 and was succeeded by Ariarathes VI Epiphanes, independent Cappadocia was larger than it had ever been. The Roman alliance had been a wise policy. However, Rome was not yet able to protect its ally against the new regional power: Pontus, which had survived the war of 182-179 and was rapidly increasing its strength. Ariarathes VI tried to appease his northern neighbor and married Laodice, a sister of its young king Mithridates, who became the real power in Cappadocia, saw to the assassination of her husband, and in 103 allied herself to king Nicomedes III Euergetes of Bithynia against her son Ariarathes VII Philometor. Two years later, Mithridates of Pontus intervened, expelled his sister and Nicomedes, restored Ariarathes VII, but on second thoughts decided to put his own son on the throne, Ariathes Eusebes. This was only the beginning of a series of civil wars, in which the last member of the dynasty, Ariarathes VIII, was soon killed. The Cappadocian nobility elected a new king, Ariobarzanes I Philoromaeus, who was recognized by the Roman Senate, but found it difficult to rule. In 95/94, he was expelled from his land by king Tigranes the Great of Armenia, returned, and was expelled again in 90 and 89 by Mithridates of Pontus, but returned and expelled Ariarathes Eusebes in c.88. During the Third Mithradatic War (73-63), Ariobarzanes had to leave his country again, but the Roman general Pompey the Great, who utterly defeated Pontus, put the Cappadocian leader back on the throne, added Sophene and Gordyene (east of the Tigris) to his realm, and took away Lycaonia. Ariobarzanes abdicated in 62 and was succeeded by his son Ariobarzanes II Philopator, who was killed in 51 and succeeded by Ariobarzanes III Eusebes, who was immediately faced with the greatest challenged a loyal ally of Rome could have to face: civil war in Rome. Be choose to support Pompey, but the war was won by his enemy Julius Caesar (48, battle of Pharsalus). Ariobarzanes, however, managed to switch sides and when a son of Mithridates VI, Pharnaces, tried to restore the power of Pontus, Julius Caesar came to the help of Cappadocia and defeated the rebel at Zela(47: "I came, saw, conquered"). Even better, parts of western Armenia were added to Cappadocia. The Roman annexation of Cappadocia was only the last step of a process of self-romanization that had began when Ariarathes IV Eusebes had allied himself to the empire in 188 BCE. But although the country had had much time to get acquainted to its new overlords, it had a strong native character. An interesting example is the philosopher Apollonius of Tyana, who was very popular in the greater, Greek-speaking world, but wrote his treatiseOn Sacrifice in the Cappadocian language. The new capital was Caesarea (modern Kayseri), and the Romans saw to the rapid urbanization of the country. To judge by the rank of its equestriangovernors (procurators) and the presence of auxiliary military units only, Cappadocia was not regarded as a very important province. Its eastern frontier, the river Euphrates, was part of the zone of influence of the governor of Syria, who used IIII Scythica and XII Fulminata, to defend this sector against possible invasions from the Parthian Empire. It was only during the civil war known as the Year of the Four Emperors (69) that Cappadocian received its first governor of senatorial rank, a man named Gnaeus Pompeius Collega. This was probably related to the merging of Cappadocia with Galatia and the annexation of Comagene, an old principality along the Euphrates and the new base of IIII Scythica. Several years later, XVI Flavia Firma was stationed at Satala; at some stage it was replaced by XV Apollinaris. The frontier was usually well-defended, but war was always possible in the ancient world. During the reign of Hadrian, governor Arrian of Nicomedia, better known as author of a book on Alexander the Great, fought against the tribe of the Alans, a war that he described in his Order of Battle. In 161, Marcus Sedatius Severianus was defeated (and VIIII Hispania was annihilated) by the Parthians, who tried to benefit from the death of the emperor Antoninus Pius and the accession of Marcus Aurelius. He sent his brother Lucius Verus to avenge this Roman defeat, and he was quite successful. In the third century, however, the Parthian Empire collapsed and was replaced by the Sasanian Empire, which had more efficient armies. In 256, they even attacked Satala, and in 260, the Cappadocian cities Caesarea, Tyana, Comana, Cybistra, and Sebastea were sacked. Several emperors were active in the east, and Rome ultimately restored its prestige during the reign of Diocletian (284-305). During the crisis of the second half of the third century, Christianity appears to have spread. During the council of Nicaea (in 325), at least ten bishops of Cappadocia were present. The circle of scholars around Saint Macrina, which included her brothers Basil the Great and Gregory Nazianzus together with Gregory of Nyssa, is usually called the "Cappadocian fathers". They played an important role in the discussions on the Trinity. The age of prosperity ended in the fifth century, when the great migrations started. In the end, Roman power in the west collapsed, but in the east, theByzantine Empire continued to exist. Its emperor Justinian reorganized Cappadocia, and there are many buildings known from this age. The historian Procopius mentions that Caesarea was rebuilt and refers to similar projects elsewhere (Buildings, 5.4.7-14). However, when at the end of the sixth century war with the Persians was resumed, after an essentially quiet period that had started in the 360's, Cappadocia became a war zone. The Sasanian king Khusrau II occupied parts of the province from 611 to 628, but was expelled by the emperorHeraclius. However, the the two empires were weakened, and the Sasanian world collapsed when the Islamic troops invaded Iran. The Byzantine Empire survived, but Cappadocia remained a border zone. It was in this age, the seventh and eighth centuries, that the Christian rock churches in Cappadocia were made - essentially hiding places.